Stay tuned! Our newsletters are coming back for 2015! More community leaders are recognizing the need to build on the resources that already exist in their communities to support the wellbeing of children when school is out. 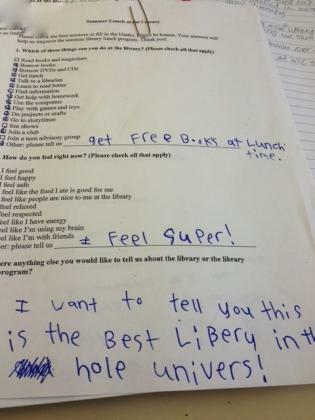 Public libraries and summer meal programs are among those resources, that, when brought together, can help combat summer learning loss and summer hunger — while providing the nucleus around which more community partnerships can be built. State Superintendent of Public Instruction Tom Torlakson recently sent a letter to school district and county office of education superintendents and to administrators of publicly-funded charter schools, urging them to support summer meal programs. In his letter (View PDF), Superintendent Torlakson highlighted the invaluable role that schools play in helping students access healthy food when school is out–and school leaders can lead this charge. Although school year priorities can often force summer planning take a back seat, investing the time now can pay off. Here are three things to focus on now to prepare for a super summer. This past summer, the California Summer Meal Coalition partnered with the California Library Association along with summer meal providers and libraries in Sacramento, Fresno, Los Angeles, and San Diego County to jointly combat summer learning loss and the summer nutrition gap through a thoughtful approach to libraries as summer meal sites. It’s Not Over Yet! Keep Your Summer Powered Up. Yes, yes, we know. You probably don’t see the juxtaposition of the words “library” and “revolution” very often. But we’re convinced that people will begin to view public libraries differently (if you haven’t already changed your perception). We’re betting that libraries are going to lead the revolution in our communities by bringing together community leaders, patrons, volunteers, and community partners in a way that keeps people connected. And we think it starts with summer meals. It’s official. 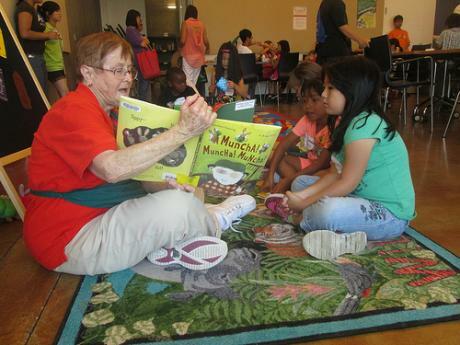 The California Summer Meal Coalition and California Library Association have jointly launched Summer Lunch at the Library, a demonstration project to bring together public libraries and summer meal providers. Have you reached out to your local 211 provider? When it comes to summer meals, 211 can be an invaluable partner. 211 is a free telephone and Web referral service–available in as many as 150 languages–that links families to local resources. 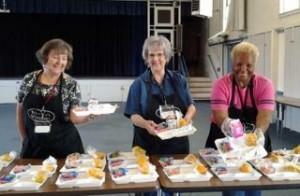 Many summer meal providers find outreach to be their biggest challenge. To develop more effective outreach strategies that draw families to summer meal programs, it is imperative that we begin with an adequate understanding of the summer landscape: The need for summer nutrition assistance; where kids are during the summer; what aspects of summer programming families find most appealing; and how they want to learn more about accessing free meals. This year’s series focuses on a range of topics including engaging elected officials, addressing the transportation challenge and more. 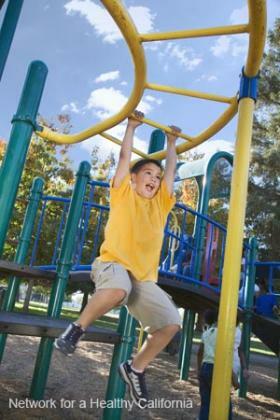 Are you engaging local businesses as summer meal program supporters? Businesses can help offset program costs while also building a stronger relationship with the community. Local businesses can recruit volunteers, provide financial or in-kind donations, or help promote your program. Now is the time for community and school district leaders to start the conversation about how they will come together to ensure that California’s low-income students do not fall through the proverbial cracks when school lets out for summer break. Let’s make Summer 2013 the best yet. How? Make a summer plan that begins with an assessment of your community. Many city agencies and community-based organizations are looking for new opportunities to engage families. Summer meal programs provide just the right opportunity — the proverbial “glue” — to bring partners together and pool resources. The California Department of Education and the Dairy Council of California will co-sponsor Teaching Healthy Habits for Life: A Community Approach, in partnership with the California Department of Public Health’s Network for a Healthy California and the UC Cooperative Extension. 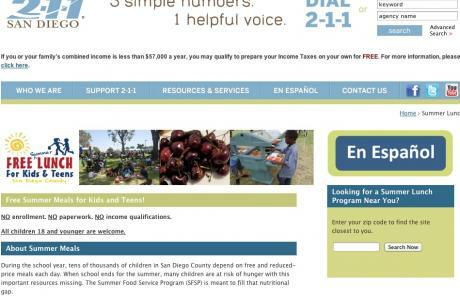 You may have noticed that the California Summer Meal Coalition’s website got a makeover. We like spiffy, but our ultimate goal is to be useful too. After the Coalition hosted its annual retreat in November in Sacramento, a common theme emerged: There needs to be a venue for summer meal providers to communicate ideas, questions, challenges, and innovative practices.